Our Sunday family dinners wouldn’t be complete without banana pudding. Usually, I make half with bananas and the other half without. The grandkids like bananas, but they don’t like them in banana pudding. I know, it’s way weird, but it is what it is. My son, on the other hand, likes a banana in every bite. This time around, on a whim, I decided to ditch the vanilla wafers and use pecan sandies to make Pecan Sandies Banana Pudding. 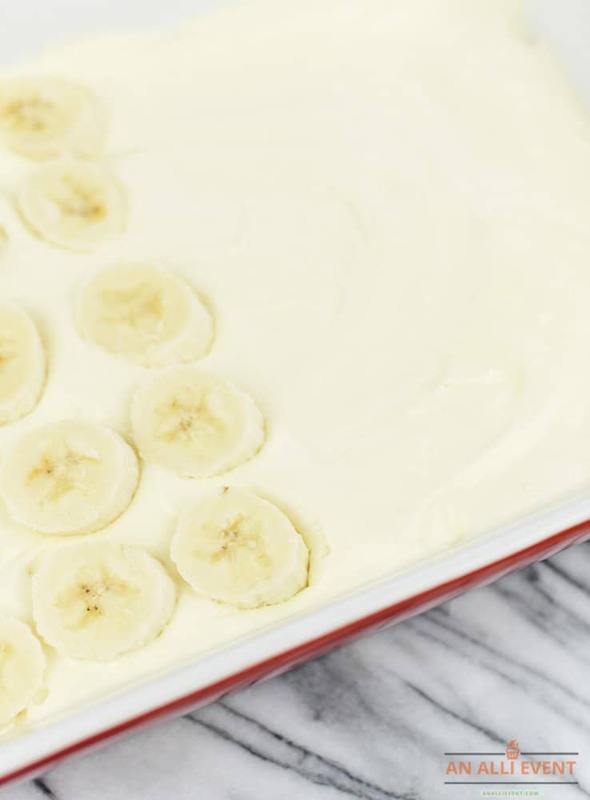 When I make banana pudding, it’s never the old fashioned “from scratch” kind. I never developed a taste for it (sorry, grandma). So, it’s instant pudding for this girl. My regular banana pudding is made with instant vanilla pudding, milk, whipped topping, bananas (half bananas) and vanilla wafers. My daughter always adds sweetened condensed milk and cream cheese. A friend always uses Paula Dean’s recipe. So, I thought I’d throw caution to the wind and come up with my own version replacing the vanilla wafers with pecan sandies. Why? Because I can. And I like to experiment. And, in case you don’t know, pecan sandies are way up on the list of my all-time favorite cookies. My family members are brutally honest when I ask them to try a new recipe I’ve whipped up. They will let me know if something is a hit or a miss. So, I’m going to let them be the judge of this dessert. According to my family, I hit it out of the park when I created Pecan Sandies Banana Pudding. Most of my family likes it better than the traditional kind. One of the grandkids doesn’t like nuts in his cookies so he ate the pudding around the cookies. There were no leftovers. Score! When I was putting Pecan Sandies Banana Pudding together, I was tempted to leave out the sweetened condensed milk. I thought it may be way too sweet. Surprisingly, it was not overly sweet at all. Yay! To make the banana pudding, whisk together the instant pudding mix and milk according to the package directions. Set aside. Combine softened cream cheese and sweetened condensed milk in a mixing bowl. Beat with an electric mixer until smooth. Mix together the instant pudding mixture and cream cheese mixture. Fold in the whipped cream. 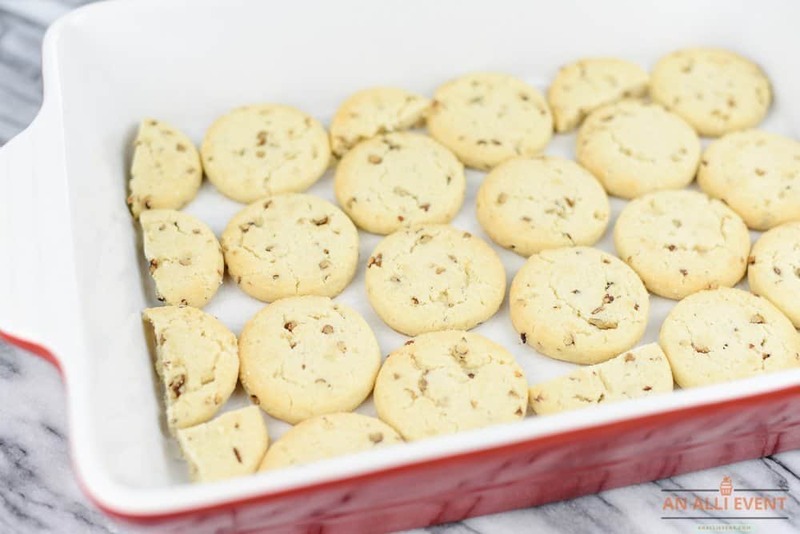 Line a 13×9 pan with pecan sandies. Add half the pudding mixture. Top with sliced bananas. Add the remaining pudding mixture. Top with pecan sandies. Refrigerate for a couple of hours or until ready to serve. In a bowl, whisk together the milk and vanilla pudding. Set aside. In a mixing bowl, combine softened cream cheese and sweetened condensed milk. Beat with an electric mixer until smooth. Combine the vanilla pudding mixture and the cream cheese mixture until well combined. Fold in the whipped topping. 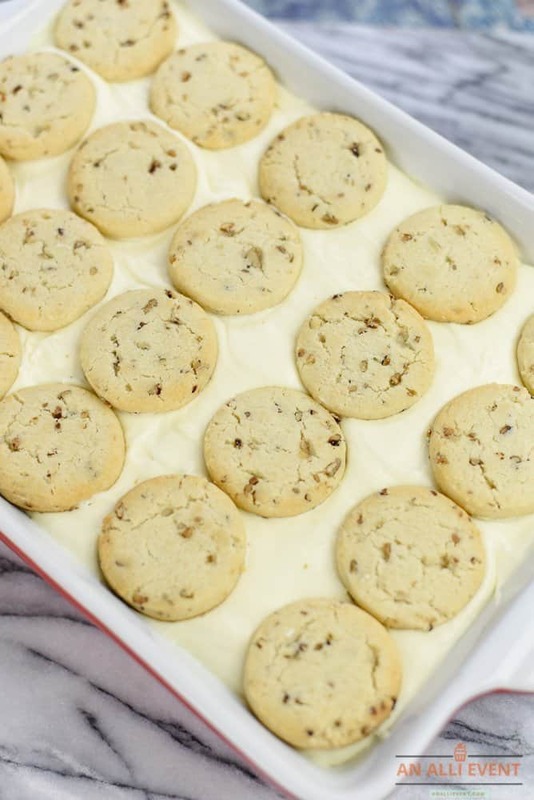 Line the bottom of a 13x9 baking dish with the cookies. Add half the pudding mixture. Top with sliced bananas. Add the rest of the pudding and top with cookies. Refrigerate until ready to serve. 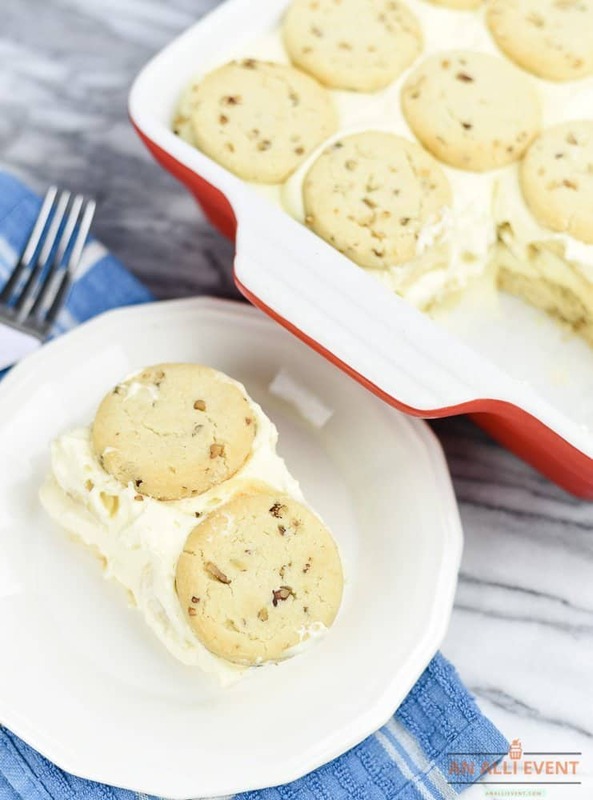 Pecan Sandies Banana Pudding is the perfect sized dessert when you’re feeding a large crowd like mine. If you’re fortunate enough to have leftovers, it’s good the next day too. I rarely have leftover dessert and if I do I send it home with the kids because it’s way too tempting. 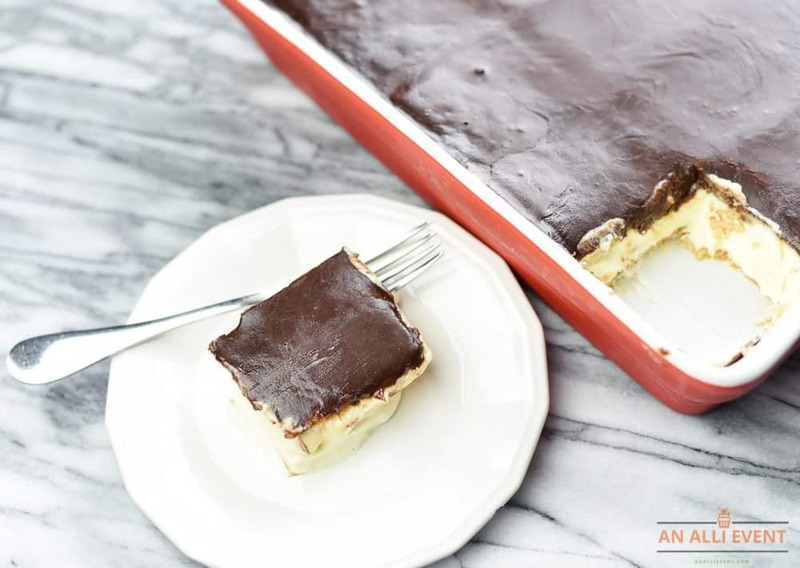 When you try this dessert (and you should) don’t make it too far in advance. Make sure you make it a few hours before you’re serving it so that the pudding mixture can soften the cookies a bit. I usually make it on Saturday night and it’s amazing when I serve it after Sunday lunch. Now, I need to decide what I’m making for the entree. It has to be made in the slow cooker (because, church, you know) and enough to feed 16. Decisions. Decisions. P.S. – I went with beef brisket for the entree. Banana pudding? OMG that sounds amazing. I can’t wait to make your pecan sandies! This whole thing sounds like one decadent dessert. I love Pecan Sandies and would love knowing how to make my own but I don’t like Bananas so this would be a treat I would make for hubby and my stepdaughter as they would like it. While making something else for my son and me. I have never thought about doing pecan Sandies on a ice cream sandwich. That is definitely something that is going to happen. Sandies are probably one of my favorite cookies. Mmmm. I can see a lot of potential using pecan sandies in pies! 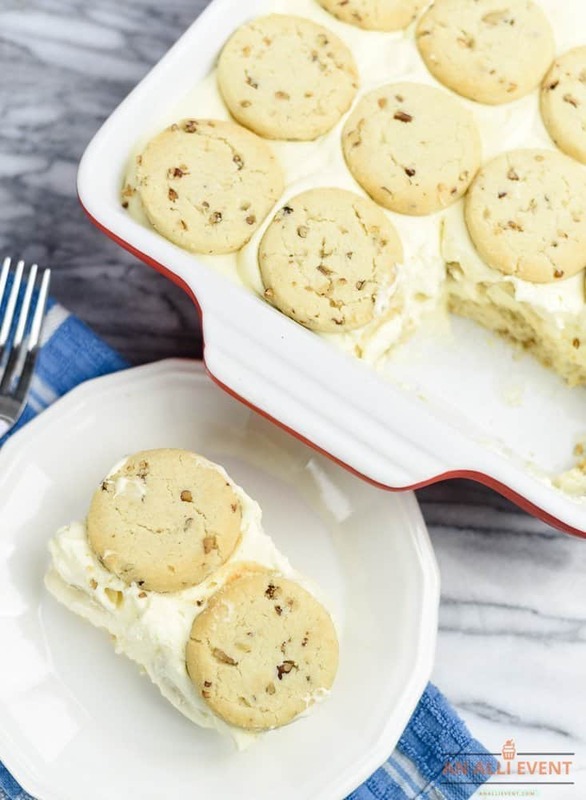 Love the banana pudding idea. My favorite! I would LOVE this dessert. I am all about bananas. These sandies look tasty too. I need to make this over the weekend. This is a really nice snack idea! I do not think I have ever had these before! I can just imagine how yummy this is! I love banana flavored dessert. And I love pudding too. It looks so good, I’m craving for some banana pudding right now! 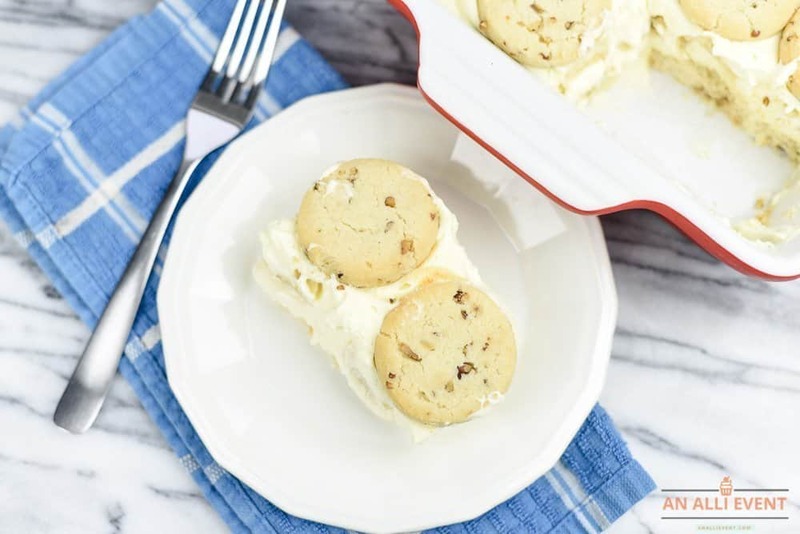 It’s definitely worth a try and replacing the vanilla wafers with pecan sandies is an idea that I’d love to copy! Thanks for the recipe! What a fun dessert! My kids are particular too with how they like their bananas and what they go in. Isn’t that funny? I bet my family would love this little treat. Two of my favorite desserts in one! I bet that is amazing. What a cool idea. I can’t wait to try this. Oh man these look so good! I would never have thought to put Pecan Sandies on Banana Pudding! This is genius! Umm… yes! I hope you can deliver because these look mighty good! I am craving them at this very moment! That looks divine! I haven’t had any good treat such as this for a while so I am salivating. It is always nice to give a twist to traditional recipes. The Pecan Sandies Banana Pudding is definitely a nice variation. We will try this out in our home too. This banana pudding recipe sounds amazing. I love pecans so I bet I would love this dessert. It looks so fun and festive. Oh I am for sure making this. I know I have a house full of kiddos that would LOVE this! Oh my these look so delicious! 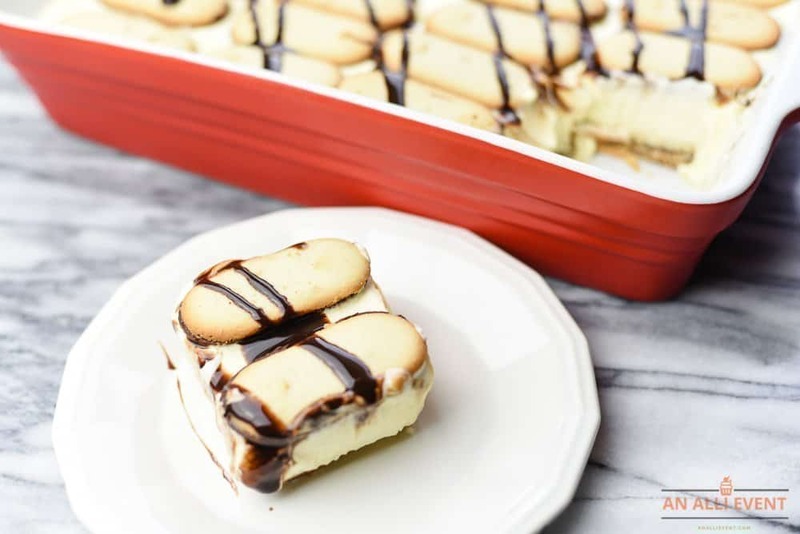 I love sandies and banana pudding, I can’t wait to make these. I know the kids will love them too!